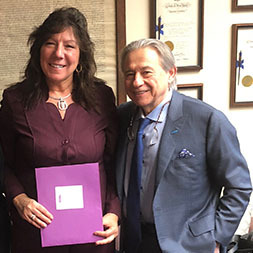 New York State Senator Sue Serino (R, C, I—Hyde Park) and Assemblymember Linda B. Rosenthal (D/WF—Manhattan), the bipartisan team responsible for successfully repealing the infamous Tampon Tax, have introduced a 2019-2020 bill that directs the commissioner of health to develop informational materials concerning menstrual disorders, including endometriosis, for distribution in schools and to patients. Given the seriousness of endometriosis, and the stigma often associated with discussing menstrual health, it is critical that the state makes an effort to educate both young women and men on this crucial issue. Given the seriousness of endometriosis, and the stigma often associated with discussing menstrual health, it is critical that the state makes an effort to educate both young women and men on this crucial issue. 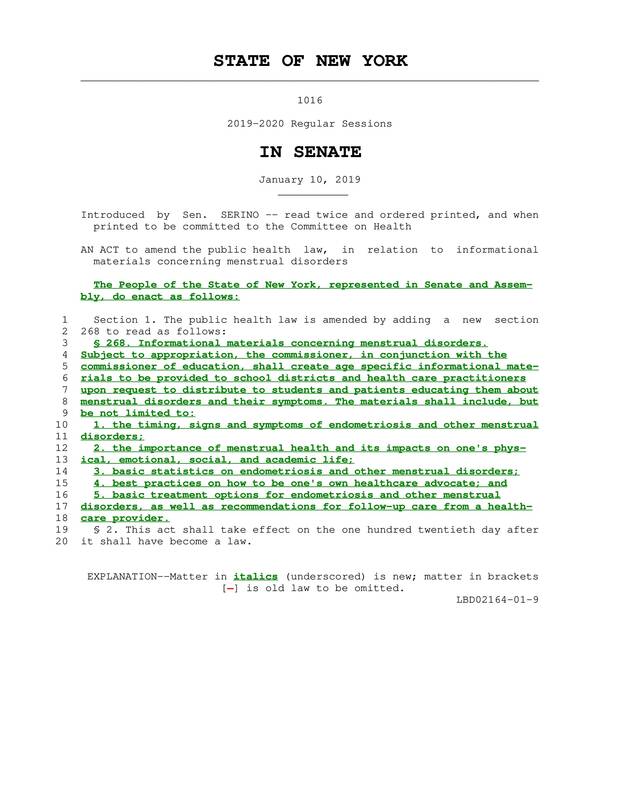 NYS Bill S1016/A484 -- Subject to appropriation, the commissioner, in conjunction with the commissioner of education, shall create age-specific informational materials to be provided to school districts and health care practitioners upon request to distribute to students and patients educating them about eight menstrual disorders and their symptoms. The materials shall include, but be not limited to: the timing, signs and symptoms of endometriosis and other menstrual disorders; the importance of menstrual health and its impacts on one's physical, emotional, social, and academic life; basic statistics on endometriosis and other menstrual disorders; best practices on how to be one's own healthcare advocate; and basic treatment options for endometriosis and other menstrual disorders, as well as recommendations for follow-up care from a healthcare provider. 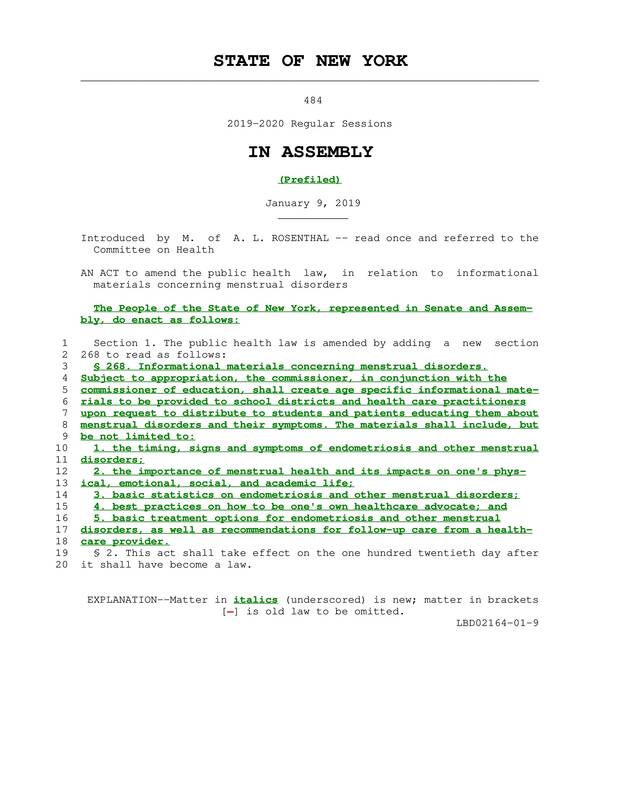 After a visit from the Endometriosis Foundation of America (EndoFound) co-founder Tamer Seckin in 2018, Serino and Rosenthal, introduced the original bill late in the 2018 session where it unanimously passed the NYS Senate but never reached the floor for a vote in the NYS Assembly. You DON'T have to be a current resident of New York State to lend your voice to the #LetsTalkPeriod campaign. 4. Share this information and encourage your friends and family to email, message, call, and sign today! Tamer Seckin, MD, Co-Founder of the Endometriosis Foundation of America (EndoFound), "Students of the ENPOWR Project have shown a keen understanding of endometriosis and the importance of raising awareness about the disease. Bringing endometriosis education to New York State’s students is a vital step in reducing a delay in diagnosis and overcoming stigmas associated with menstruation. The sooner one understands that pain with their period is not normal, the sooner they can seek treatment and work with a specialist to help prevent more serious issues from affecting their wellbeing in the long-term. Everyone deserves the opportunity to thrive, those living with endometriosis are no exception." Padma Lakshmi, Co-Founder of the Endometriosis Foundation of America (EndoFound), "All teenage girls and boys should learn about periods and the symptoms of endometriosis since ten percent of females suffer from it. If I had known in high school, I could have saved myself so much pain and isolation. It would have been such a game changer." Lena Dunham, actress, writer, publisher of Lenny Letter and Board Member of the EndoFound, "Here’s a call to action for women, girls, and public health. 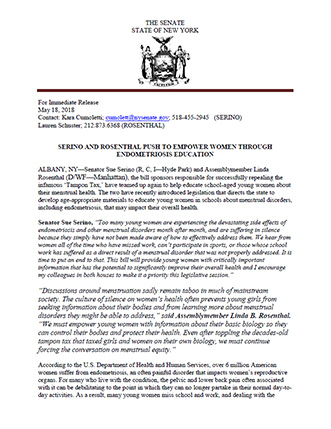 Senator Sue Serino and Assemblymember Linda Rosenthal, the legislators who led the successful effort in New York State to repeal the Tampon Tax, have teamed up to introduce legislation to ensure that school-aged girls are educated about menstrual disorders including endometriosis. End the silence around women's health, and encourage your state’s policymakers to follow their lead!" Dr. Piraye Yurttas Beim, Founder, and CEO of next-generation women's health company Celmatix and Board Member of the EndoFound, "Based on current trends, every five seconds a baby girl who will grow up to develop endometriosis is born. As a patient myself, I know the consequences of learning too late in life that the symptoms of endometriosis are not a normal part of being a woman. There is a pressing need to get more information and resources about this devastating condition into the hands of women earlier in their lives. I applaud Senator Serino and Assemblymember Rosenthal for taking on this important cause, and hope very much that the rest of the country will follow New York State’s example." Molly Qerim, ESPN host, "If this bill was passed and girls were educated, it would prevent them years of suffering- pain, flu-like symptoms, fatigue, imbalance, medications, surgeries and most importantly, preserve their fertility. All ailments I struggled with for years." Kym Jackson, NCIS actress, "If schools had mandatory education for girls about periods, my symptoms would have been obvious to anyone—but we just don't get taught that stuff." Diana Falzone, TV personality and endometriosis advocate, "It's so important that endometriosis is taught in and a part of our school system especially at an early age when women are just learning about their bodies and their periods. Young girls need to know the signs and symptoms of endometriosis so that when they do go to the doctor, and they speak with their gynecologist, they can detail their symptoms to them, and the doctor can provide better treatment. The sooner they get treatment, the sooner they can be free from pain and the better options they have for preserving their fertility. Endometriosis education and knowledge is power. I hope that this is the beginning of spreading the word about endometriosis. Hopefully, New York will be the pioneer of this change, and it will spread nationwide and internationally."